We take pride in our craftsmanship and quality and do everything we can to make our rings as durable as possible. However, the materials we use are natural and thus can be vulnerable to water or chemicals and breakage from impact. 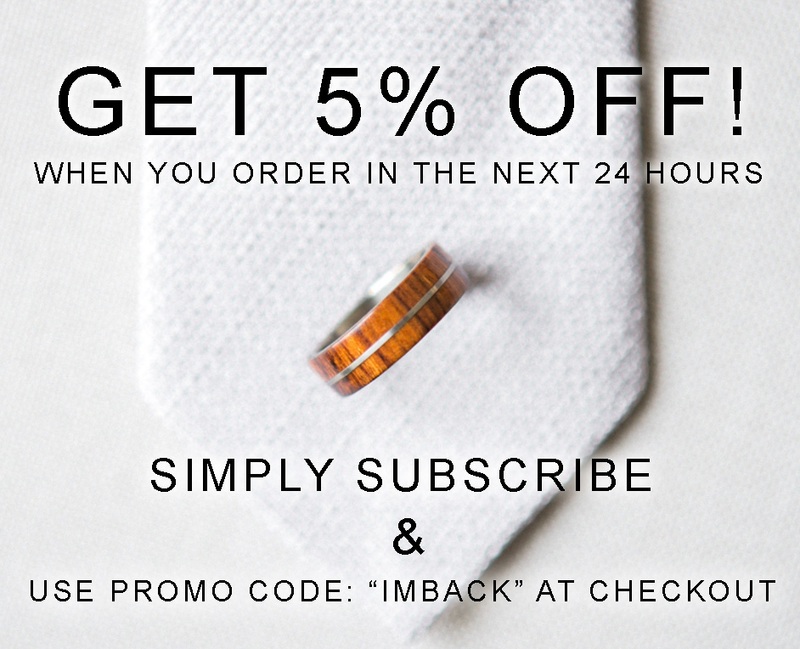 For this reason, we offer a lifetime limited warranty which will give you peace of mind and keep your handcrafted ring protected and looking great for years to come! Water or Chemical Damage: Your warranty will cover remakes or repairs of damaged natural materials caused by water or chemicals. Impact, Scratching or Accidental Damage: Your warranty covers remakes and repairs to natural materials caused by impact, scratching or other accident related abuse. While we do everything we can to make each ring as durable as possible, we do use natural materials in our rings which require extra care and the rings are not indestructible. Due to the use of these natural materials your ring should not be expected to withstand the same amount of abuse as a solid metal ring would. We can repair inlays and liners for a small fee (if no warranty is purchased), but keep in mind the price will vary depending on the amount of damage. Because each ring is a custom commissioned piece we do not offer refunds. We cannot refund a ring that has cracked or broken due to abuse. These rings are made with natural, organic materials. If your ring has broken or needs repairs, please contact us and we will offer solutions. We stand behind our products and are happy to repair your ring so that you can continue to enjoy it. Because each ring is commissioned by you and handmade to order we cannot issue a refund due to buyers remorse or buyer negligence. That being said, we stand behind our product and if the item was made incorrectly we are happy to fix any missed design details or manufacturer defects. Remember, your ring features organic inlays which need special care and will vary in appearance. Please be advised that we do not offer cash refunds and all sales are final. We love the opportunity we have to create custom rings for our clients, but on very rare occasions a client refuses to abide by our stated guidelines or makes demands that are outside of what was initially agreed upon or were paid for. For this reason we reserve the right to cancel ring orders (issuing a refund) or refuse service to these clients. Please be kind to your unique, organic ring. It was made just for you! Please note the warranty must be purchased with the ring or before the ring arriving in the mail.